This all-round kite combines state-of-the-art technological expertise to make light wind kite flying fun. 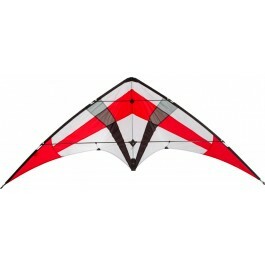 The Stratus delivers outstanding light wind performance on calm days when other kites will not get off the ground. Even the slightest breeze of 3 km/h is sufficient to fly this machine high into the sky. The Stratus masters the latest freestyle acrobatics and most of the old and new tricks while ensuring a high level of precision – all at a down to earth price. The Stratus glides with the slightest breeze, but even higher winds above 20 km/h will not throw this kite off track. With the Stratus, almost any day is a good day to fly. This is New, Ready to Fly HQ-Stratus with some small stains on the sail.